Five UWM engineering students will go to Taiwan in February to study at Chung Yuan Christian University and work at a Foxconn facility. 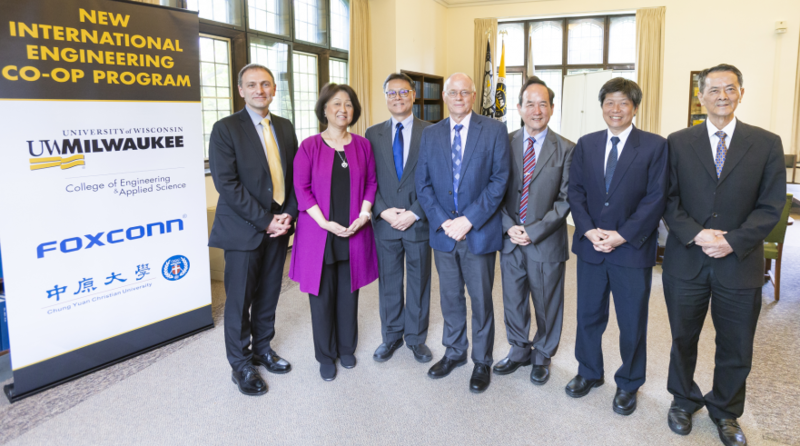 UWM, Foxconn Technology Group and Chung Yuan Christian University signed an agreement Thursday to create an international co-op program in which UWM engineering students will study at the university in Taiwan and work at a Foxconn facility there before returning to UWM to complete their degrees. The co-op program will introduce engineering students to liquid crystal display fabrication technology and processes, preparing them to help launch Foxconn’s new facility in Wisconsin, which will be the first of its kind outside of Asia. LCD panels are used in a variety of high-tech consumer electronics products, such as smart phones. The first five interns will be selected this fall and spend time working in a Mount Pleasant complex leased by Foxconn before going overseas in February. They will take classes in culture and language at CYCU, meet with Foxconn employees and work on practically oriented applied research projects in preparation for their upcoming co-op. They will continue work on their research projects at one of Foxconn’s facilities in Taiwan through June 2019. The Foxconn co-op program eventually could be expanded to other colleges and universities in Wisconsin and the Midwest. The co-op program builds on an existing study abroad program for engineering students with CYCU in Taiwan. Thirty-one students have participated in the UWM-CYCU study abroad program since it started in 2009. 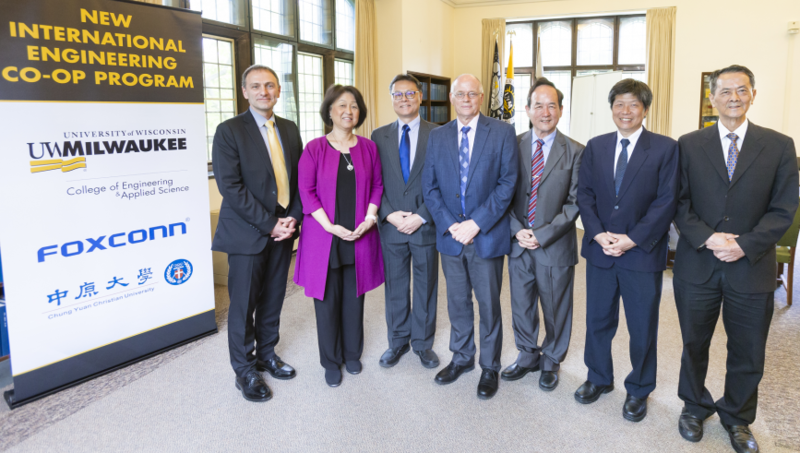 A key feature of the program is that students from UWM and other universities in the United States collaborate with those from CYCU and Southeast University in China on engineering projects, including some sponsored by Taiwanese industrial companies. The new international co-op program with Foxconn will be the second international internship/co-op program at the UWM College of Engineering & Applied Science. Rockwell Automation established an internship program with the college in 2016 in which engineering students work at its facility in Shanghai, China, in partnership with Shanghai Jiao Tong University. The first two students in that program have been hired by Rockwell, and two more are participating in the internship this summer. Students interested in UWM’s College of Engineering & Applied Science can reach an academic advisor at: ceas-adv@uwm.edu or 414-229-4667.